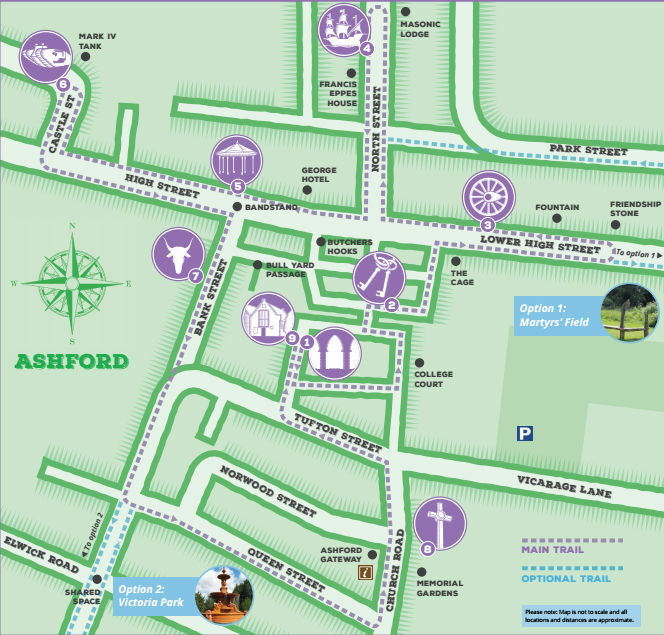 A brand new, exciting trail highlighting Ashford Town Centre’s heritage sites will be launched on Sunday 5th June, in conjunction with Ashford Farmers’ Market. The Heritage Trail takes visitors on a journey through history as they discover many of Ashford’s significant sites. Visitors can see the beautiful Edwardian architecture in North Street, Victoria Park’s Grade II* listed Hubert Fountain and much more. Three tours will take place on the day led by Blue Badge guides at 10.30am, 11.30am and 12.30pm. The meeting point will be on the Lower High Street at the Heritage Trail stand. 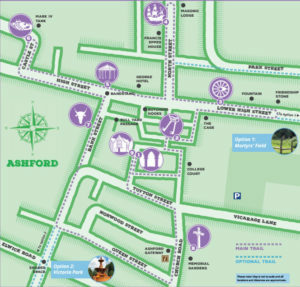 Starting from the High Street, the tour will meander through the Town and finish at Ashford Borough Museum. The walk takes approximately half an hour, is free to enjoy and is suitable for all ages. As part of the launch, visitors have the chance to enter a special photo competition. Simply snap a shot from your favourite part of the day and post in on Twitter with the hashtag #AshfordHeritageTrail to be in with the chance of winning a family ticket to the WillesboroughWindmill. What’s more, a special story called Eric the Time Travelling Cat will be launched on the day and youngsters will have the chance to receive their free copy and win a soft toy of Eric the Cat. Copies of the book will be handed out by the council’s T-CAT team. Several special guests will also be helping to celebrate the launch of the Heritage Trail. We are delighted to welcome Romney Marsh Brewery to the festivities and they will be offering up delicious, locally brewed Kingswood Mead for visitors to sample. Keep your eyes peeled for a brave Knight and a gallant Monk who will be walking through the cobbled streets adding to the historic atmosphere. There will also be a set of wooden stocks on the High Street, so make sure you’re well behaved! Pop along to the Heritage Trail stand for an opportunity to meet curators from Ashford Borough Museum and learn about the fascinating history of our town. There will also be original old photographs of how the town centre looked hundreds of years ago on display as well as other interesting artefacts. In addition, there will be live music from DJ Gideon and Sarah Lucy Dole who will be performing in the music gazebo. Those interested in joining the tour can book their space by contacting tourism@ashford.gov.uk or visiting the Tourist Information Centre at the Ashford Gateway. Tickets are limited so visitors are advised to book in advance to avoid disappointment on the day. The Tourist Information Centre is open Monday to Saturday between 10.15am and 3pm.